Home » 5 Freshest » Caramel Apple Sugar Babies. Gimme sum shugga Baby. Caramel Apple Sugar Babies. Gimme sum shugga Baby. I think Jonny picked these Caramel Apple Sugar Babies up because they were part of the new Halloween goods at the local shop. Caramel apples do always remind me of Halloween but why? There’s “Bobbing for apples”, sure, but no caramel there. There’s caramel, of course, given the Halloween = candy equation, but I think caramel apples are probably more 4th of July summer or Disneyland…. 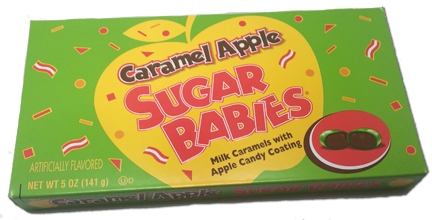 Anyhoo – I always loved Sugar Babies because they taste like the only caramel I remember eating as a kid. Plus they were the slightly less difficult to eat version of a similar candy: the Sugar Daddy hard-as-heck-to-start-then-too-chewy-as-heck caramel on a stick lollipop. So I had a knowing “I’ll give these a go” nod when Jonny brought these Babies over. It’s fair to say the Gurus enjoy apple candy with caramel apple sweets having their fair share of positive reviews. Caramel Apple Sugar Babies had 2 stars going in. I like the size of these babies – like a thick soy bean. 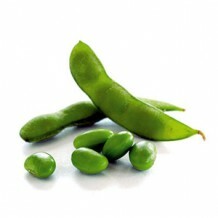 Think Edamame. Which means eating 2 at a time is fine; more than 2 and you’ll feel like a pig. Truth is, I wasn’t in love with these on my first go at them. I wanted less fake semi-sour apple and more actual caramel. The apple lingered but it wasn’t spectacularly apple-yr, not like Jolly Rancher apple for example. And the sour wasn’t really sour enough. But hold the phones! I keep mentioning the ‘sour’ in these… but nowhere in the package does it SAY sour. So I’m getting some sour overtones and it’s not even advertised? I like! Give it another star! That gives these Caramel Apple Sugar Babies 3 stars with little to no work. Bump that up to 3.5 stars since Jonny told me before I even started writing that he likes these. Even when I was hemming and hawing, Jonny was not. Let’s get down to brass tacks: the caramel is good, slightly salty and olde skool. 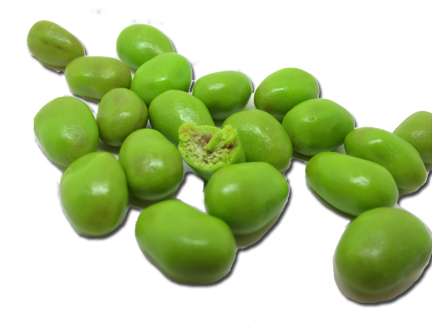 The apple green shell is just thick enough to ensure the apple flavor stays in there throughout the entire experience. And now that I’ve pounded half a box… I realize I actually do like these – even subtracting the pre-review positives. Solid 4 stars babies!